A Public Safety Communications system is a wireless communications system used by first responder and emergency services personnel such as police, fire, emergency medical, homeland security, and disaster response agencies to prevent or respond to incidents or situations that pose a threat to people or property. An In-Building Public Safety Communication System ensures that radio signals are able to penetrate into all areas of buildings, including areas that are especially difficult for RF to penetrate such as stairwells, elevators, basements, and thick-walled or shielded areas. Bands of frequencies, especially in the VHF and UHF parts of the spectrum, were allocated by the FCC for communication between fixed base stations and land mobile vehicle-mounted or portable transceivers. 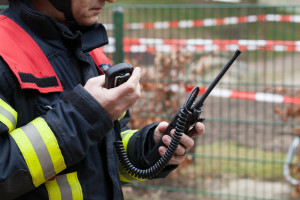 Police radio and other public safety services such as fire departments and ambulances have traditionally been found in the VHF and UHF parts of the spectrum. (45MHz, 150MHz, 220MHz, 400MHz, 500MHz). These analog radio systems were primarily designed for voice communications. Today, new Public Safety frequencies and systems use digital technology and include other bands such as the 700 MHz and 800 MHz. First responders need a reliable, resilient, optimized wireless broadband network to carry out their mission. Not only must they communicate instantly without interruption, but agencies must collect and filter through all the information streaming in from the community. Interoperability among agencies and secure transmissions are critical to an effective coordinated response. An optimized Public Safety network is needed to assure priority communications the moment they’re needed. An optimized network also provides end-to-end encryption, safeguarding sensitive information transmitted over the air wirelessly. 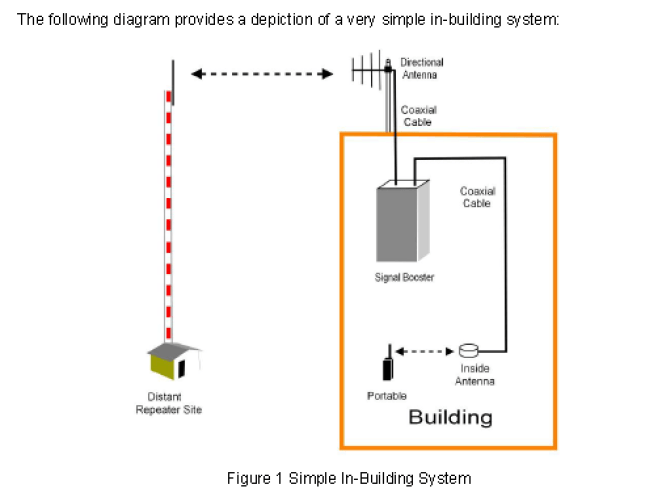 Much like a Cellular DAS System, an In-Building Public Safety Communication System comprises sources (means of sending and receiving to the area’s various PS radio bands), bi-directional repeaters, and a series of antennas distributed strategically throughout a building to pass the transmit and receive from the radio system to individual radios. In-Building Public Safety Communication Systems are needed for the same reason that In-Building Cellular DAS are being installed. Radio signals have limited propagation through various materials. Factors include how deep inside a building the receiver may be, wall composition, whether a building has energy saving “low-e glass” or other energy saving cladding, the specific frequencies in use (low frequencies penetrate better). Today’s first responders not only rely on dependable voice communication, but increasingly also on data, telemetry, and location information. In an emergency situation where a matter of seconds can mean the difference between life or death, every tool at the first responder’s disposal must be absolutely reliable. The need for in-building wireless communications has driven efforts to develop national model codes by the National Fire Protection Association (NFPA) and the International Code Council (ICC). Codes issued by these groups include the National Fire Code, National Electrical Code, International Fire Code, and International Building Code. Almost every city and county in the United States subscribes and complies with one or more of these codes. The NFPA and ICC continue to develop national level model codes focused on In-Building Public Safety Communication Systems. National level model codes should also lead to standardization of the quality of equipment and to additional qualified in-building system engineers and installers. The NFPA and ICC national level model in-building code development is being driven primarily by fire jurisdictions. However, the initiatives are expanded to involve all public safety, including law enforcement and emergency medical services. The NFPA and ICC initiatives are separate but complementary. While the precise provisions of the draft codes vary between the two code development groups, key specifications involve significant commonality across the two initiatives. In addition, all the features of existing local codes are permissible under the new draft national level code framework. Each jurisdiction can “customize” the national level model code to meet any unique local requirements. •Provisions for waivers of the requirements. As an example, as of December 31, 2014, the New York City Building Code requires, in Sections 403.4.4 and 907.2.13.2, that an in-building auxiliary radio communication (ARC) system be installed and maintained in all newly‑constructed high-rise buildings. An ARC system is a wireless two-way building communication system for Fire Department use only that receives and transmits Fire Department portable radio frequencies within the building. An ARC system typically consists of a transceiver (base station) connected to a building-wide antenna system, with a radio console in the building lobby. Section 917.1.2 of the New York City Building Code and Section FC 511 of the New York City Fire Code together require that ARC systems be installed, acceptance tested, operated and maintained in accordance with the Fire Code and the rules of the Fire Department. In-Building Public Safety Communication Systems are typically the responsibility of the building owner or equivalent. While Cellular DAS have often been financed by Wireless Carriers or Third Party Operators like Crown Castle, Mobilitie or American Tower, they have typically not been willing to fund or operate In-Building Public Safety Communication Systems. There are several reasons for this, predominant among those that public safety systems are simply not part of their network infrastructure to provide their service. Additionally, there is a perception of taking on costs, risks and liability associated with design error, performance, ongoing monitoring and maintenance, and periodic re-certification. Another perceived risk is the potential for ongoing changes to codes and ordinances, which could create unknown future responsibilities or costs. That said, with the proliferation of codes and ordinances at the local and county level, are becoming analogous to mandatory sprinkler systems – just part of the plumbing and part of doing business. Deployment of solutions for reliable public safety in-building coverage must consider the spectrum environment, building parameters, and the users’ operational needs. As with most systems for public safety, whether indoor or outdoor, reliable solutions require customization, high-quality products, good systems engineering, and proper installation and maintenance. Reliable public safety in-building systems are not a “cookie cutter” design with one size fits all. O.3.1 General: The document requires that the RES operate without causing interference to other parts of the public-safety radio system and that technologies be employed that are compatible with the public-safety radio system. Most RES employ an over-the-air broadband BDA at the donor antenna. These devices are notorious for causing harmful interference, especially if there is poor isolation between donor and coverage antennas (there should be 15 dB minimum). Annex O envisions a permitting process whereby the system design must be submitted to the authority having jurisdiction (AHJ) for approval before it can be installed. O.3.2 Radio coverage: Two types of building areas are defined: critical areas and general building areas. Critical areas include emergency command centers, fire pump rooms, exit stairs, exit passageways, elevator lobbies, standpipe cabinets and other areas deemed critical by the AHJ. Critical areas must have 99% coverage, while general building areas must have 90% coverage. O.3.3 Signal strength: Minimum inbound and outbound signal strengths of -95 dBm are required. Note that a typical 12.5 kHz FM radio will operate satisfactorily at -102 dBm in multipath fading. When measuring signal strength at the repeater site, the gain of any amplifiers between the antenna and receiver must be used to translate the -95 dBm threshold to an equivalent carrier-to-noise ratio at the receiver. One weakness of Annex O is that it does not explicitly recognize the role of radio interference other than to say that the RES must not interfere with other parts of the public-safety radio system. In other words, the document specifies signal strength alone when it should specify a minimum carrier-to-interference-plus-noise ratio. This oversight is mitigated somewhat by specifying a minimum delivered audio quality (DAQ) in the section on testing. Although not stated in the document, we must presume a building that meets the requirements of O.3.2 and O.3.3, without enhancement, does not require an RES. Similarly, enhancements only should be required on floors or in areas that do not meet radio-coverage requirements. O.3.4 System frequencies: The RES must be capable of retransmitting all relevant public-safety frequencies, and these frequencies are to be provided by the public-safety agency through the AHJ. O.3.5 System components: Signal boosters, including BDAs, shall have FCC type acceptance and must be operated in accordance with commission rules (for example, see CFR Title 47, Part 90.219, Use of Signal Boosters). O.3.7 System monitoring: An automatic-monitoring system — with a dedicated panel in the emergency command center of the building — is required. The system must signal an alarm in the event of an antenna malfunction or signal-booster failure. A separate alarm for oscillating amplifiers is desirable. Power supply systems must, at a minimum, signal an alarm when AC power is lost, when the battery charger fails and when the battery has a low charge (defined as 70% of capacity). Now that we’ve examined the major components of Annex O, let’s take a look at the building owner’s and the AHJ’s responsibilities regarding radio enhancement systems. Responsibilities of the building owner: For new buildings, the building owner or architect should engage an RES designer to estimate the needs for enhanced coverage and to ensure that the proper infrastructure is installed to accommodate the RES. If an RES is required, the building owner or his authorized agent is responsible for system design, permitting, purchasing, testing and maintenance. Responsibilities of the AHJ: The AHJ has many responsibilities and these responsibilities may be daunting unless expertise is available in-house or an outside expert is retained. First and foremost, the AHJ must decide which buildings fall under the jurisdiction of Annex O. New buildings only? All buildings of more than 100,000 square feet? Existing buildings that have undergone recent modifications? The AHJ also must specify the frequencies to be amplified on the system, being mindful of any new frequencies planned by the public-safety agency in the future. Because all amplification systems introduce time delays, the AHJ must specify the maximum delay (in microseconds) that can be tolerated by the radio system. Usually, only narrowband channelized amplifiers introduce enough delay to cause problems in overlap coverage areas. The AHJ must review RES permit applications and issue permits for new systems. And finally, the AHJ must ensure qualified technicians are available to review test plans and oversee testing. Close coordination with the building owner is key for this consideration. The antenna location should be chosen to minimize coax cable run distances while having good line of site to the transmitting station. Ideally it should be near a building edge to avoid transmitting signal across a rooftop. Signals transmitted across rooftops can leak into floors below, causing an RF feedback loop which can degrade or disrupt system performance. Suitable roof penetration and waterproofing techniques are required. Existing penetrations are ideal. It is best to coordinate with the owner’s roofing contractor if a new penetration is required, especially in the case of rubberized roofing. Not doing so could void the owner’s roof warranty. Another consideration is antenna height. At issue are visual aesthetics, PIM (Passive Intermodulation Interference) performance, and wind loading. In general property owners prefer that donor antennas are not obvious. RF neutral screens and other camouflage techniques can be used to minimize this concern. PIM interference can be created by locating an antenna too close to metal structures of metallic roof flashing along building edges. Extra antenna height and careful placement can reduce or avoid this problem. Finally, antenna masts and ballast suitable for the required height are important. Taller masts must be sturdier and use more ballast to handle added wind loading. These must be matched to roof load bearing ability and antenna type. Cables must be properly protected to avoid cable or roof damage. Best practice is to route donor coax through PVC, raised on sleepers to avoid roof damage. Proper grounding and lightning arrestors are required per code. After the outside surveying is complete, the next order of business is identifying a vertical chase that will get the cable runs from floor to floor. Once this has been identified, a network closet/IT room where the booster equipment can be parked must be located. Ideally, you would want the two elements; the vertical chase and the network closet/IT room to be as close to each other as possible – if not one and the same. A walk through the facility should allow the DAS designer to begin to see potential cable runs in certain locations more so than others. Certain areas should jump out that would be better locations for internal antennas. These areas should be hallway juncture points and areas that are in need of strong coverage (e.g., manager’s office, security office, etc.) consistently. This would mandate a dedicated internal antenna within close proximity. Another item to look for is the method of transport for the cabling. Are there dedicated cable trays? Is conduit required? Does the local fire code mandate plenum ratings on the cable? If fiber is the method of delivering RF, is there any dark fiber available to use? If so, what type is it? Is the fiber of the single mode or multimode variety? What do the ceilings look like? False ceilings? Hard lid ceilings? A mix? The amount of labor to get through different ceiling types will vary as will the time/cost. Ceiling types will have a huge impact on which antenna to use. In some cases, the end customer may want the antennas out of view. Examples of what the antenna looks like should be presented to the customer for approval from a cosmetic perspective. How high are the ceilings? Will a hydraulic lift be required to gain access for antenna installation? These are items that need to be considered when doing the site walk. An area where core drilling is required is an important cost/time consideration that can be identified during a thorough site survey. Firewall locations need to be identified as they require special prep work for penetrations and pulling cable from one side to the other. The building materials used in the construction of the building and walls should be scrutinized closely. What is the makeup of the walls? Drywall, sheetrock, cement blocks, brick? Is there any metal? In hospital environments, lead will be present in the walls near radiology units. What about insulation or ductwork? Metallic backing on certain types of insulation will strongly attenuate RF signals from propagating. Metal duct work will also have an impact on a RF signal. Annex O of the NFPA specifies Testing and Maintenance requirements. The AHJ is allowed some discretion when it comes to testing, but the document recommends voice-quality testing (using actual radios on the hip) on a uniform grid, as well as a method for determining the size of the grid and the pass/fail criteria. In addition to voice-quality testing, Annex O also specifies a method for collecting outbound signal-strength measurements with a spectrum analyzer or test receiver. Measurements are to be collected while walking in an X pattern, with at least five measurements per side of the X and at least one measurement every five feet. 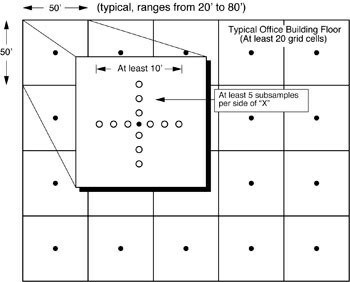 The collected samples then are linearly averaged and applied to the center of the grid cell. The gridding and signal-measurement methodology is shown in Figure 1 (below). FIGURE 1 Signal-strength measurements are to be collected while walking in an X pattern, with at least five measurements per side of the X and at least one measurement every five feet. (Source: www.firstnet.gov) Signed into law on February 22, 2012, the Middle Class Tax Relief and Job Creation Act created the First Responder Network Authority (FirstNet). The law gives FirstNet the mission to build, operate and maintain the first high-speed, nationwide wireless broadband network dedicated to public safety. FirstNet will provide a single interoperable platform for emergency and daily public safety communications. This broadband network will fulfill a fundamental need of the public safety community as well as the last remaining recommendation of the 9/11 Commission. FirstNet will bring 21st century tools to tens of thousands of organizations and individuals that respond to emergencies at the local, state, tribal and federal levels. The FirstNet organization is the first of its kind. Never before has Congress established an independent government authority with a mandate to provide specialized communication services for public safety. Using nationwide 700 MHz spectrum, FirstNet will put an end to decades-long interoperability and communications challenges and help keep our communities and emergency responders safer. The law gives FirstNet a blueprint for its mission. It outlines processes and guidelines that FirstNet must follow in building the network. FirstNet is tasked with cost-effectively creating a nationwide network and providing wireless services to public safety agencies across the country. Through the assessment of fees, FirstNet must generate sufficient funds to enable the organization to operate, maintain and improve the network each year. Congress made history by allocating valuable spectrum and up to $7 billion in funding for the construction of the FirstNet network. To create a nationwide network, all 56 U.S. states and territories must have a radio access network that is connected to the FirstNet core network. To contain costs, FirstNet is tasked with leveraging existing telecommunications infrastructure and assets. This includes exploring public/private partnerships that can help support and accelerate the creation of this new advanced wireless network. FirstNet is an independent authority within the U.S. Department of Commerce’s National Telecommunications and Information Administration. FirstNet is governed by a 15-member Board consisting of the Attorney General of the United States, the Secretary of Homeland Security, the Director of the Office of Management and Budget, and 12 members appointed by the Secretary of Commerce. The FirstNet Board is composed of representatives from public safety; local, state and federal government; and the wireless industry. These dedicated individuals bring their expertise, experience and commitment to serving public safety and meeting the FirstNet mission. States that meet these criteria and receive FCC approval may apply for grant funding through the NTIA. The First Responder Network Authority Board of Directors is a team of 15 experts. The FirstNet Board was established as part of the Middle Class Tax Relief and Job Creation Act of 2012. Representatives include the Secretary of Homeland Security, the Attorney General, and the Director of the Office of Management and Budget as permanent members. The remaining members are selected by the Secretary of Commerce and have public safety, technical, network, and/or financial expertise. FirstNet is headquartered in Reston, Virginia.